Just as our turkey-fatigue is lifting and the taste of pumpkin pie is leaving our mouths, it’s time to start thinking about the Advent and Christmas seasons. If you’re anything like me, your Christmas gift shopping list will sit next to your Advent Journal for the next few weeks as you attempt to grow closer to Jesus and also not forget that you have Uncle Ned’s name for this year’s Christmas gift exchange. When shopping for my family and friends, I like to support ethical small businesses, especially if they’re owned and operated by Catholics. 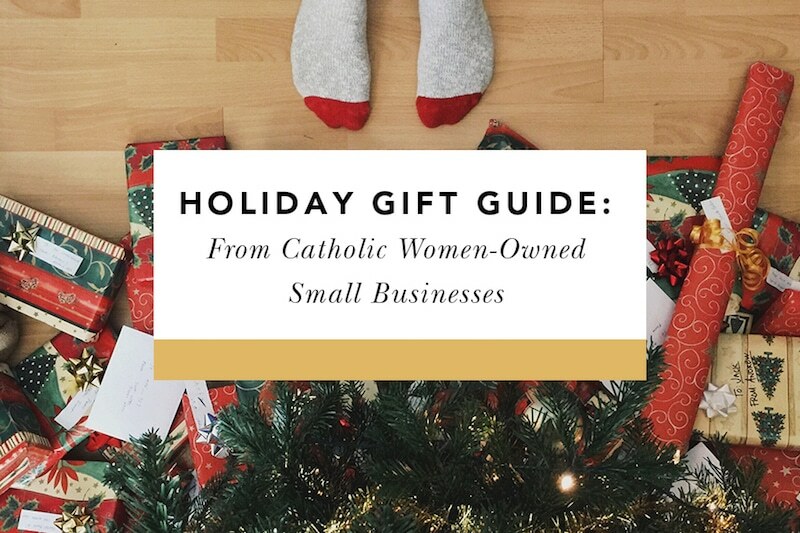 In case you like to do the same, we at Blessed is She put together this Catholic holiday gift guide highlighting Catholic women-owned businesses (including several Black Friday/Small Business Saturday/Cyber Monday coupon codes just for Blessed is She readers!). 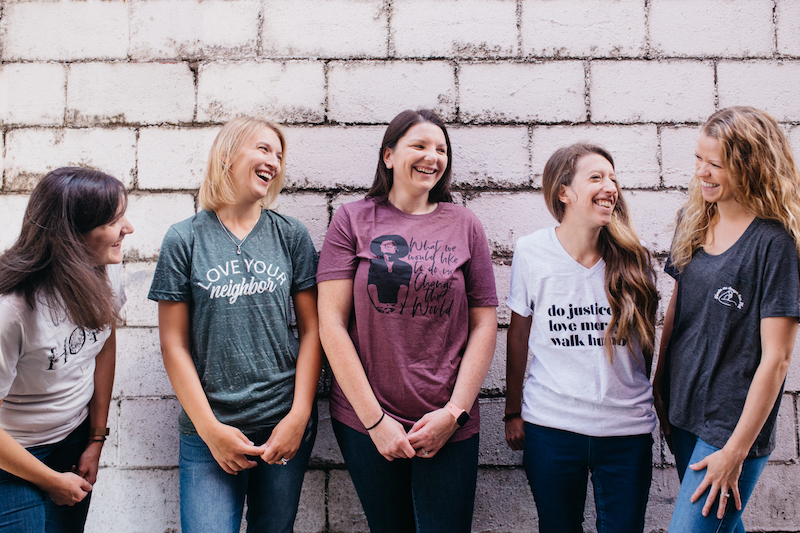 You can feel great about supporting these women as they use their God-given gifts and fostered skills to create true, good, and beautiful products. If you’ve been around Blessed is She for a while, then you’re familiar with the artwork of Erica Tighe. 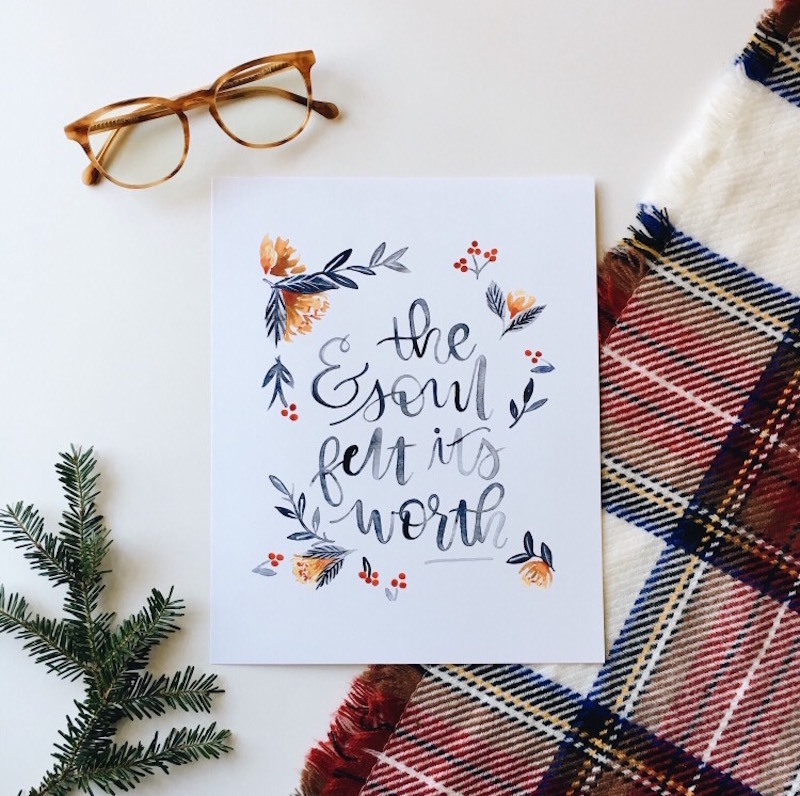 She is immensely talented, and her shop offers calligraphy and lettering workbooks, greeting cards, prints, cake toppers, bandanas, pins, stickers, bathing suits, swaddles, and more. Be a Heart Design is offering a sale starting this Friday through Monday, November 26 (no code necessary!). Free Marian sticker with every order! This is your place to shop for all the Catholic babies you love. Elizabeth makes a myriad of baby items with a Catholic touch including soft saint dolls, leggings, baby bloomers, and quiet Mass toys. You can get 20% off orders of $30 or more Friday through Monday, 11/23 – 11/26, no coupon code necessary. BIS readers can get free shipping every day through the end of 2018 with the code “SHIP18”. Our friend, Carolyn, creates stunning works of art with personality. We adore her animal prints, her mugs, and her hand-lettered work is catchy and inspirational. 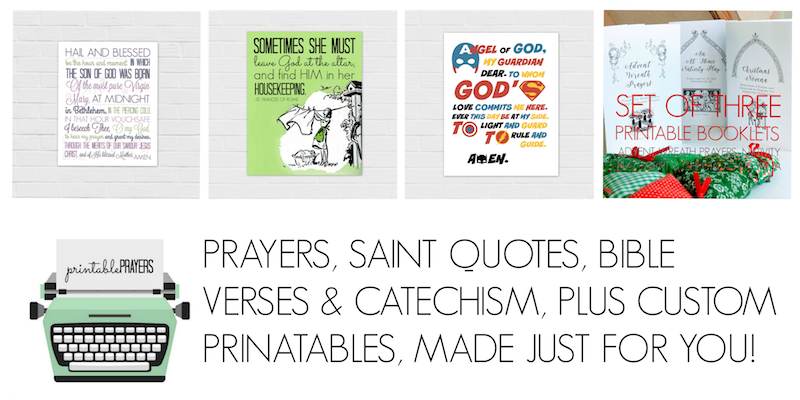 Lauren’s gorgeous Etsy shop is brimming with Catholic themed prints, t-shirts, aprons, mugs, and more. Seriously, go get you some. 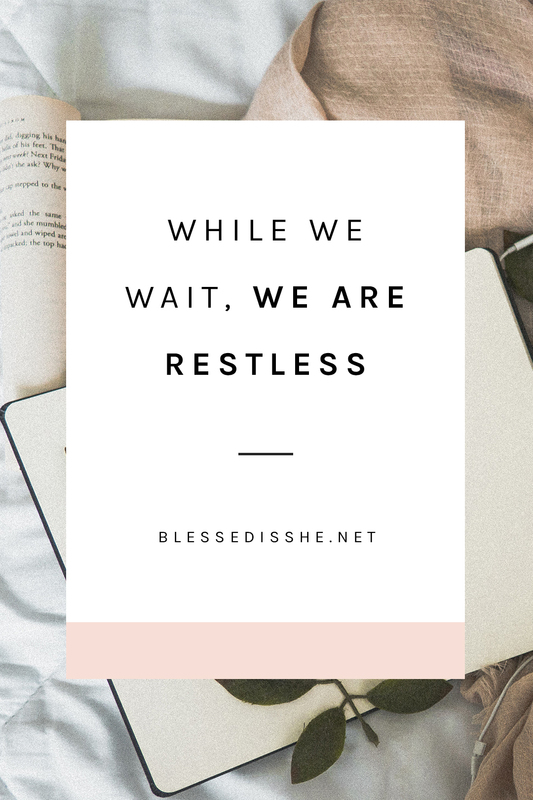 Use the code “blessedisshe” at checkout for 10% off from November 23rd-30th! Happy mail that is pretty enough to frame. Jenna’s postcards are beautiful and sturdy, so your sweet note to a friend turns into instant decor. While you’re there, grab a print, a liturgical living guide, or a journal to work on that holiday anxiety. Call Her Happy is offering BIS readers 10% off everything in shop. Use the code “BISSISTER” at checkout! Nicole dreams up and creates beautiful Catholic jewelry. Remember your Faith throughout the day and dress up your outfits with God-centered rings, earrings, necklaces, and more. There are also jewelry collections in leather, bronze, sterling, and gold filled, and Marian Consecration bracelets and scapulars. There are even jewelry and devotionals for the men and children on your lists! Caritas Dei is offering the BIS Community 15% off through November 30th with the code “BIS15”. Surprise quarterly packages delivered to get kids excited about their Catholic faith! Catholic Family Crate sends fun and holy mail to help families learn about the Faith, pray together, grow in relationship with God, and connect as a family! It’s super easy for parents as all the materials are included to dive into liturgical seasons and teach their children about various Catholic topics such as the Rosary, the Mass, etc. All the content is theologically edited and created under the guidance of theologians, Catholic Montessori teachers, and Catechesis of the Good Shepherd catechists. Their mission is to empower parents as the primary educators of their children and help families create a Catholic culture in the home. 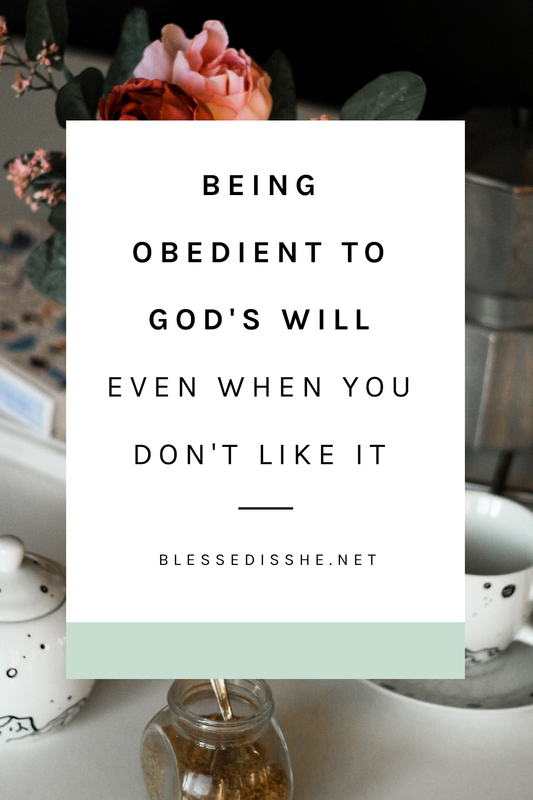 Use code “BLESSEDISSHE” for 10% off of all purchases through December 24th. 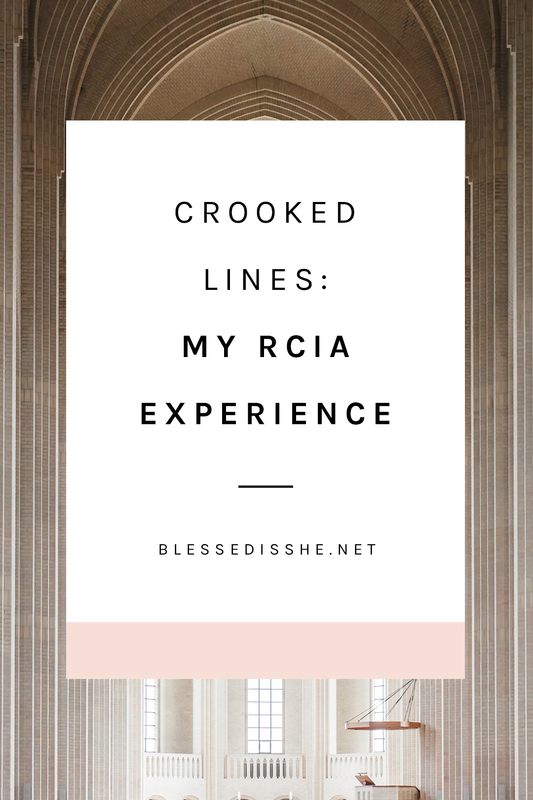 Have a new or expectant mama in your life (maybe it’s you!)? Chews Life creates safe, chewable products that can stand up to the biggest teeth-ers. We’re loving this necklace for moms that allows the baby something accessible and safe to chew on! 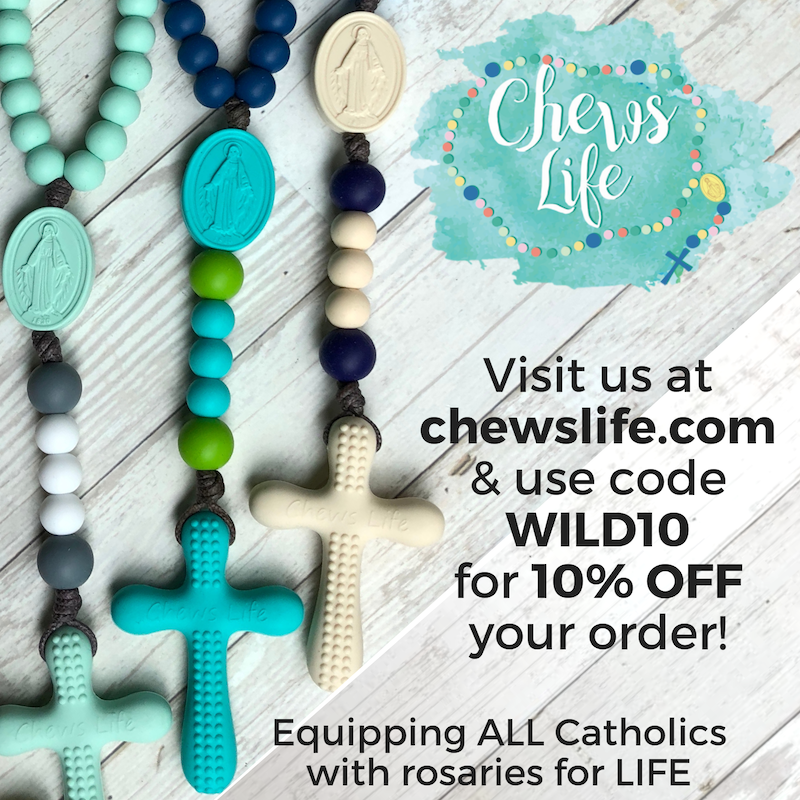 Chews Life is offering you 10% off your order with the code “WILD10”. Do you enjoy sewing, or know someone who does? On the hunt for new Catholic-inspired fabrics and quilt patterns? Faith and Fabric creates one-of-a-kind cotton fabrics, inspired by the beauty of our faith, as well as gorgeous quilt patterns for all levels of sewists. Faith and Fabric Designs is giving BIS readers 10% off any purchase with code “THANKYOU”. Marie creates beautiful prints that she paints and hand-letters. 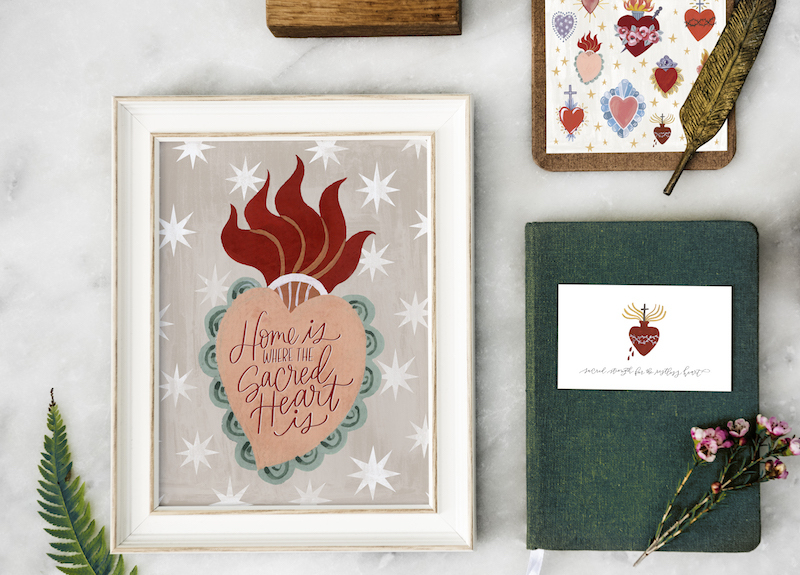 She sells both religious and non-religious prints, mugs, totes, and moleskin notebooks. Use code “SHOPSMALL” for 25% off starting on Thanksgiving and ending the following Monday at 11:59 PM. 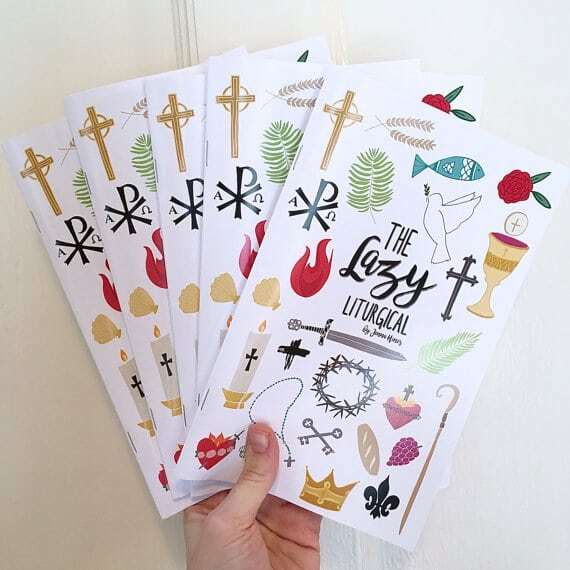 One of our favorite subscription print services is now offering their Simple Saints collection. These are absolutely gorgeous (check out their Two Hearts print!) and would be a lovely addition to any space. Frameable Faith is offering BIS readers a special discount. Use code “BIS2018″ for Buy-1-Get-1 Free Simple Saint Prints (any size, unlimited quantities) until 12/25/18. 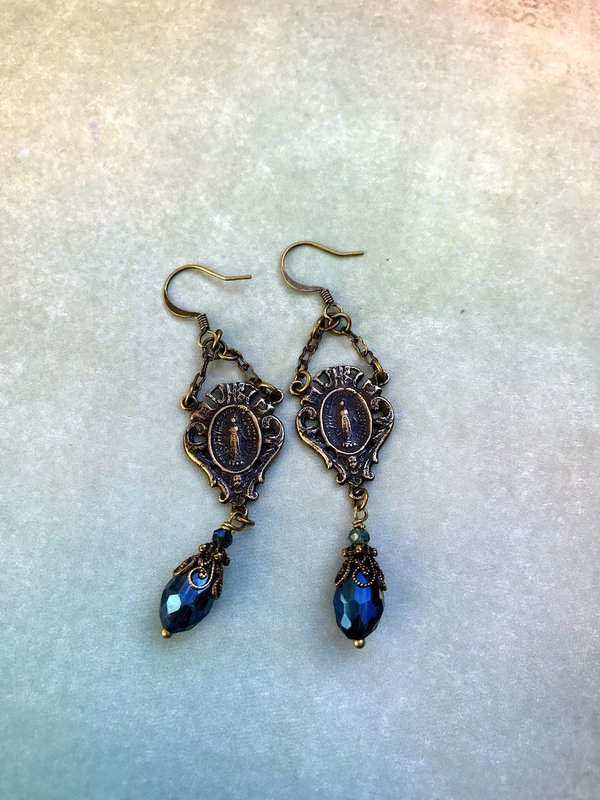 Find gorgeous Catholic jewelry with a vintage flair here. 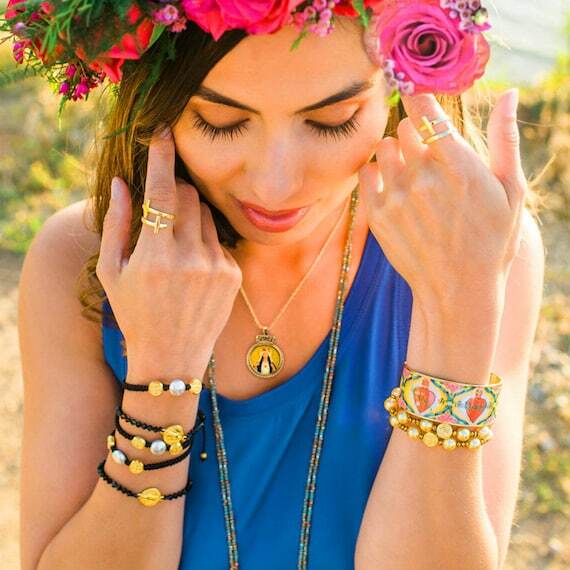 You can browse through unique pieces like earrings, necklaces, bracelets, and more. Rosaries and wholesale options are available, too! Use code “Mary18” for free shipping on all orders over $20 from Black Friday until December 24, 2017. 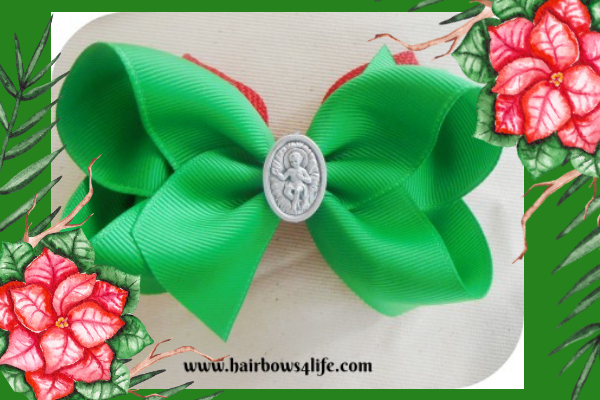 These precious hair bows include a Catholic medal in the center! There are bows of all sizes and style and for various occasions like Baptism and First Communion. 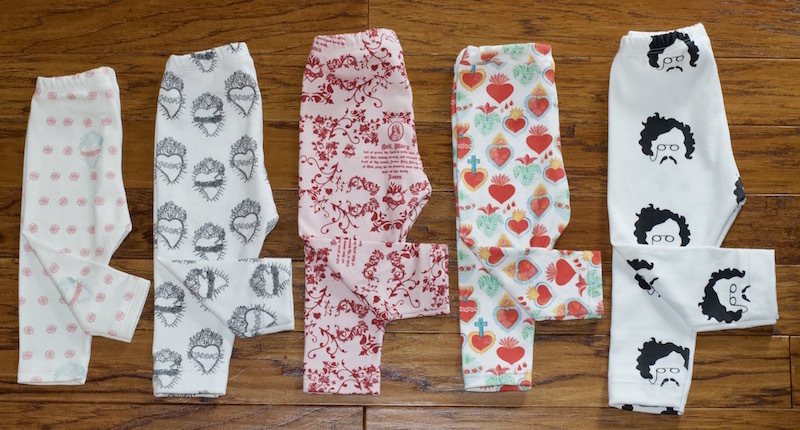 Hair Bows 4 Life is giving BIS readers 20% off + free shipping using the code “BlessedisShe2018”. 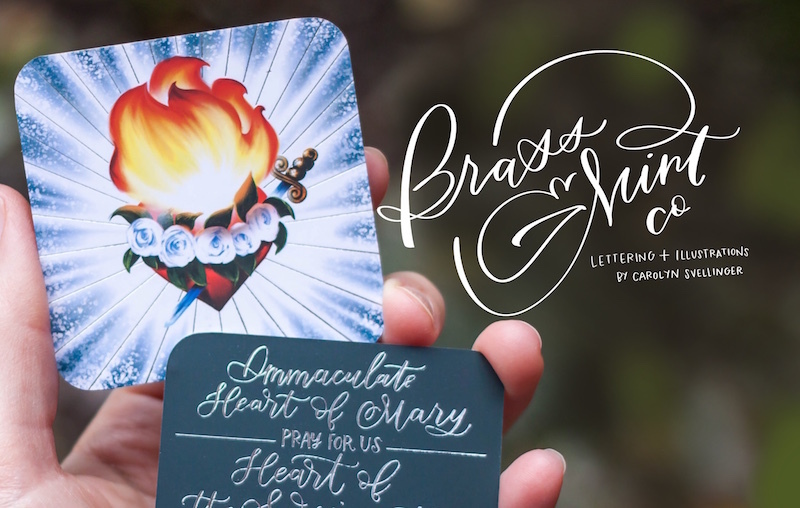 Find pretty and meaningful Catholic gifts, artwork, and temporary tattoos at Just Love Prints. With hundreds of unique items to choose from, you’re sure to find something for everyone on your list this Christmas! Enjoy 15% off your order of $20 or more with code “BIS18” at checkout. Expires January 1, 2019. This shop designs and creates beautiful rosaries. There are decade Rosaries, felt-ball Rosaries, and wall Rosaries. They also do seasonal, liturgical, and Sacrament celebration garlands in addition to their wall Rosaries and prayer beads. 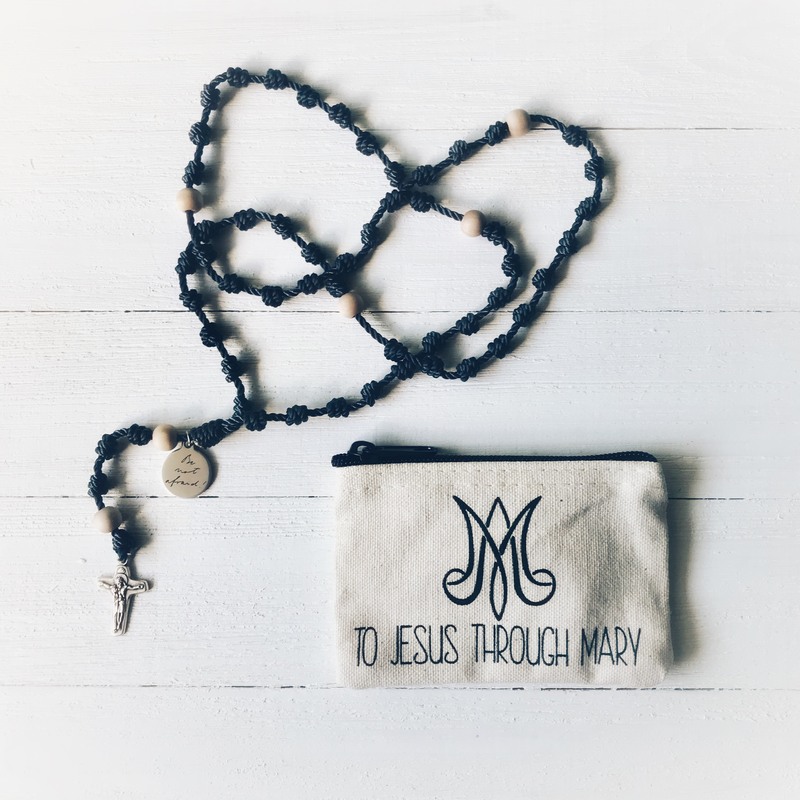 They are happy to take custom orders in addition to their stock items, so dream up your perfect Rosary and they can make it happen! The entire store will be 15% from Black Friday through Cyber Monday, and you can get free shipping on Saturday with code “SMALLBIZ2018”. 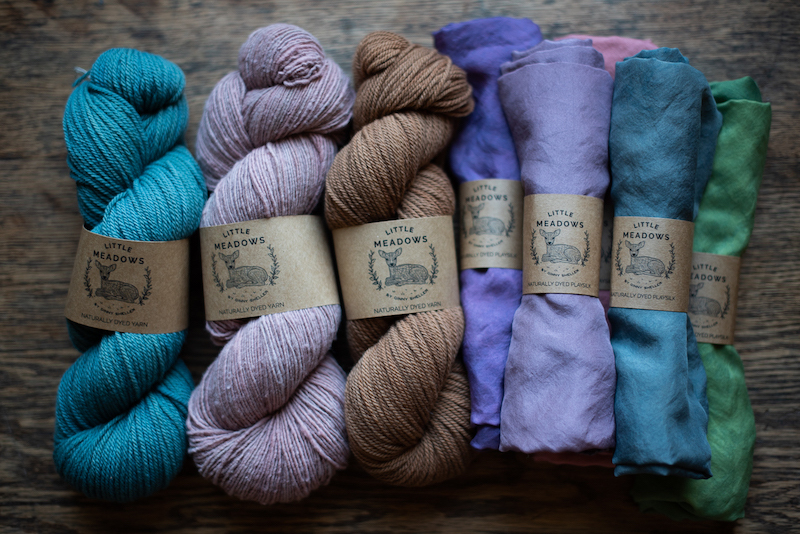 At Little Meadows, Ginny offers naturally dyed, eco-friendly yarn and scarves along with naturally dyed playsilks and swaddles for the little ones in your life. Brianna’s shop offers you the unique ability to customize the look of her Catholic-themed apparel in a variety of shirt and design colors. You have to go check out the gorgeous foil options! She also sells sweatshirts, tote bags, mugs, and stickers so you’re bound to cover everyone on your shopping list. Lively Faith Co. is offering a variety of sales this holiday weekend! On Black Friday, buy 3 regular priced tees, get one free using code “BLACKFRIYAY”. On Small Business Saturday, you’ll get a free gift with $50+ purchase. And for Cyber Monday: Spend $50+ and get 10% off (code: CYBER10); Spend $75+ and get 20% off (code: CYBER20); Spend $100+ and get 30% off (code: CYBER30)! From Meaningful Market’s page: We believe beauty and justice go hand in hand. Authentic Identity can’t be separated from truth. Humanity is good, and that goodness should be displayed. We wanted to create a place where the artist, storyteller, and world changer could converge and create magic to an unbelieving world. We wanted to operate in a spirit of abundance where we sow into others gifts, ministries, and organizations and watch them flourish. Meaning Market is offering BIS readers 25% off their entire purchase until December 5th with the Holiday Code “BISHOLIDAY”. Both the kids and adults in your life will love these hand-painted peg dolls. There are plain peg dolls you can paint yourself, customizable peg dolls to depict your family, even wedding cake toppers! These would be a fun gift for the whole family. Me Oh My is offering the BIS community 20% off using the code “OHMY20BIS” – it begins now and expires December 1st! This shop is your go-to for custom invitations, party supplies, Christmas cards, and paper goods. Bernadette’s work is creative and provides a unique look to your home or gathering. We also love her meaningful pillows. Meyer Market Designs is offering 15% of with the code “THANKYOU”. 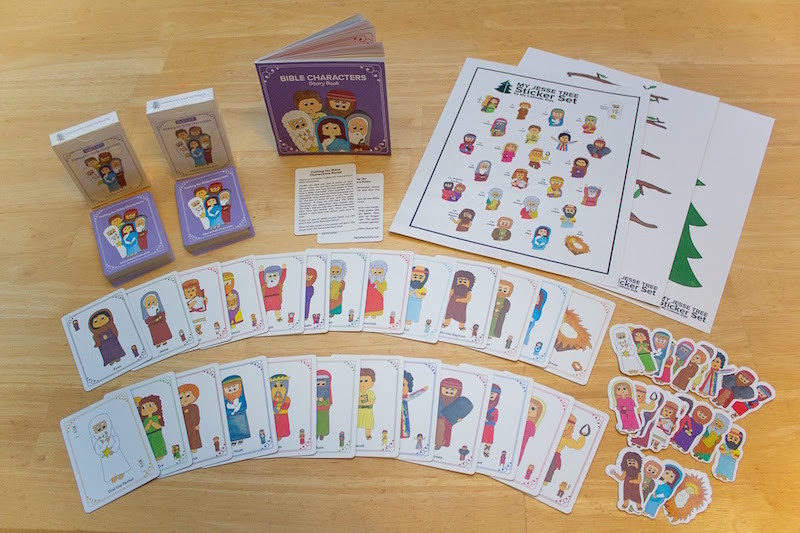 Spend $30 (before shipping) with My Catholic Kids and receive a free deck of Fishing for Saints. No coupon required, just mention Blessed is She in the comments, and they’ll add it to your order free! 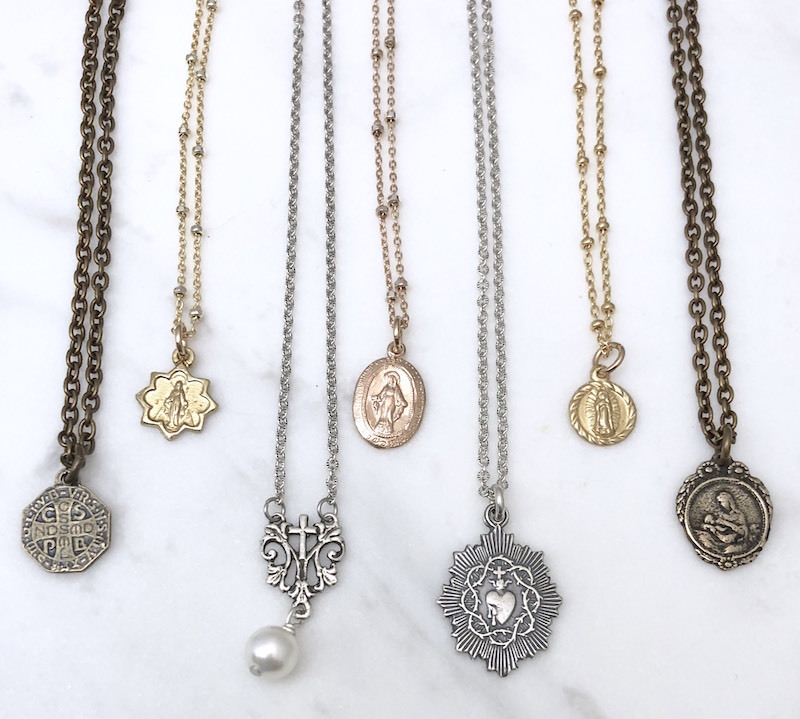 We love these minimalistic, trendy jewelry pieces that integrate the Catholic Faith into their designs. Their blessings bracelets would make a great stocking-stuffer! 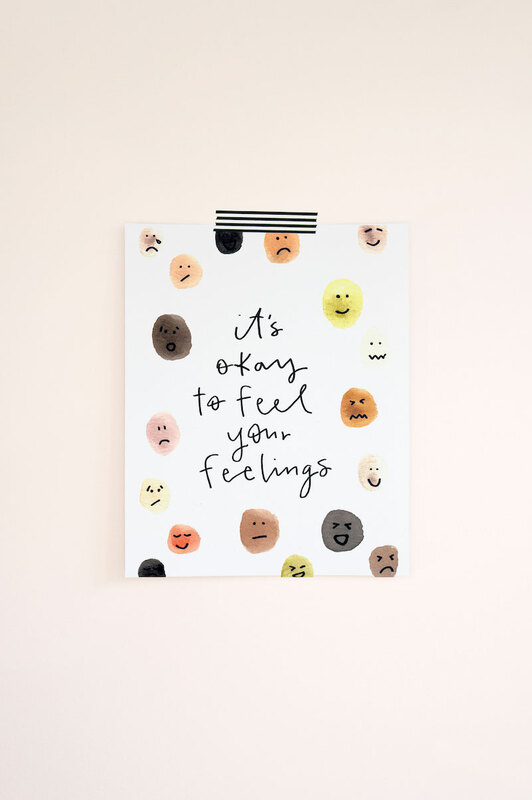 Pink Salt Riot makes products that help you remember to practice joy. In this crazy world, in your crazy life, in the midst of your undeniably crazy family, we need those little things, those little reminders that point our eyes back to Him. Back to Christ, back to His Cross. BIS writer Kendra Tierney knows a thing or two about liturgical living. 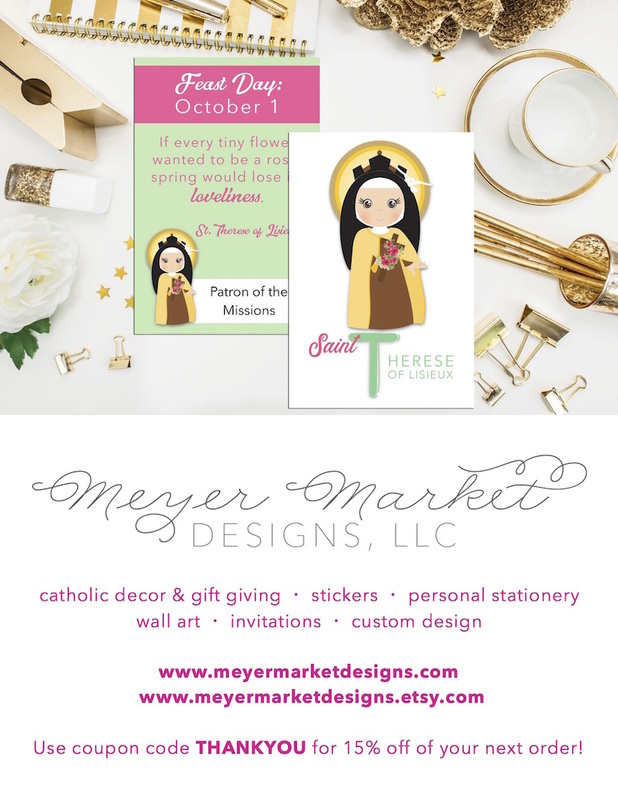 So she created a shop full of Catholic printables to deepen your prayer life and knowledge of the Faith. There’s something for everyone in your family in this shop, and custom orders are available. 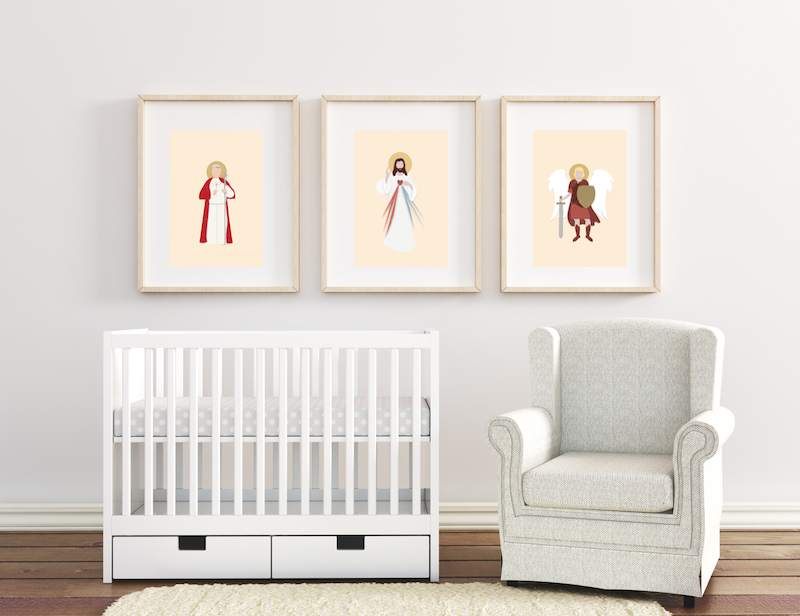 We love her Corporal and Spiritual Works of Mercy print! Use the code “BISADVENT” for 25% off any 2 or more items through December 18th. 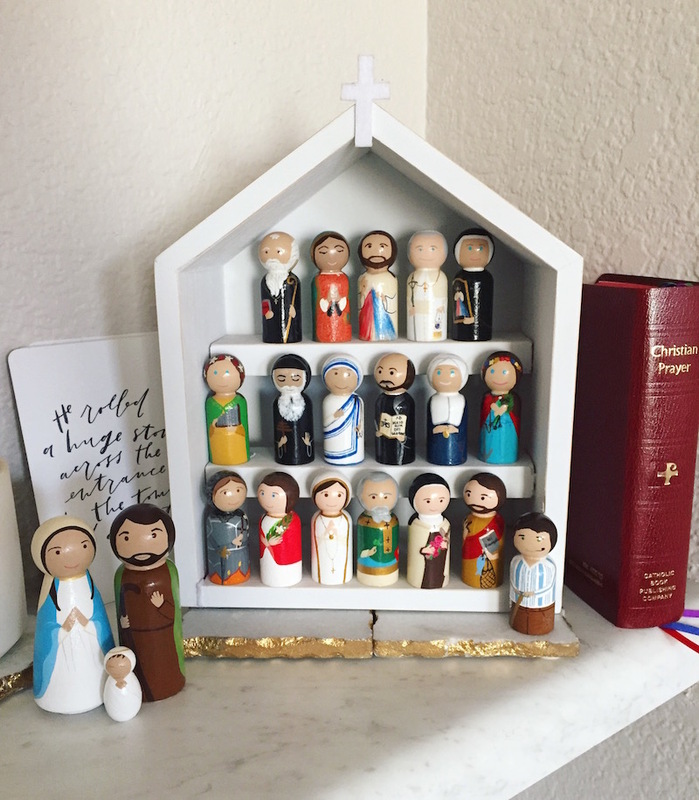 Providential Co. creates gorgeous and unique Catholic-themed items for your home and spiritual life. 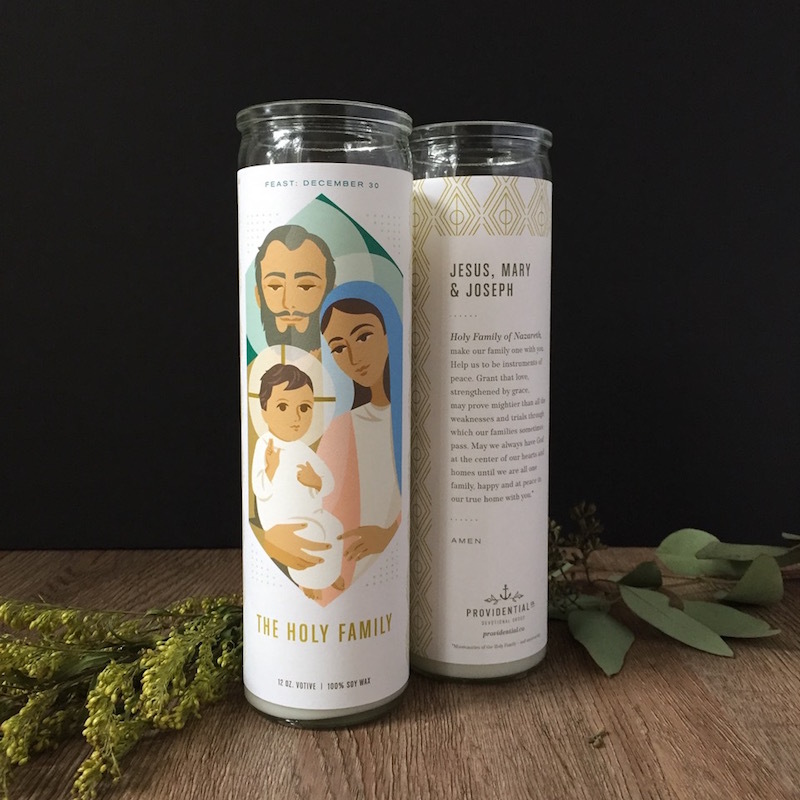 You can find illustrated Rosary pouches, prayer cards, prints, and these amazing soy prayer candles. Providential Co. is offering BIS readers 15% off through December 8th with the code “BIS2018”. Need an easy way to navigate the Bible? 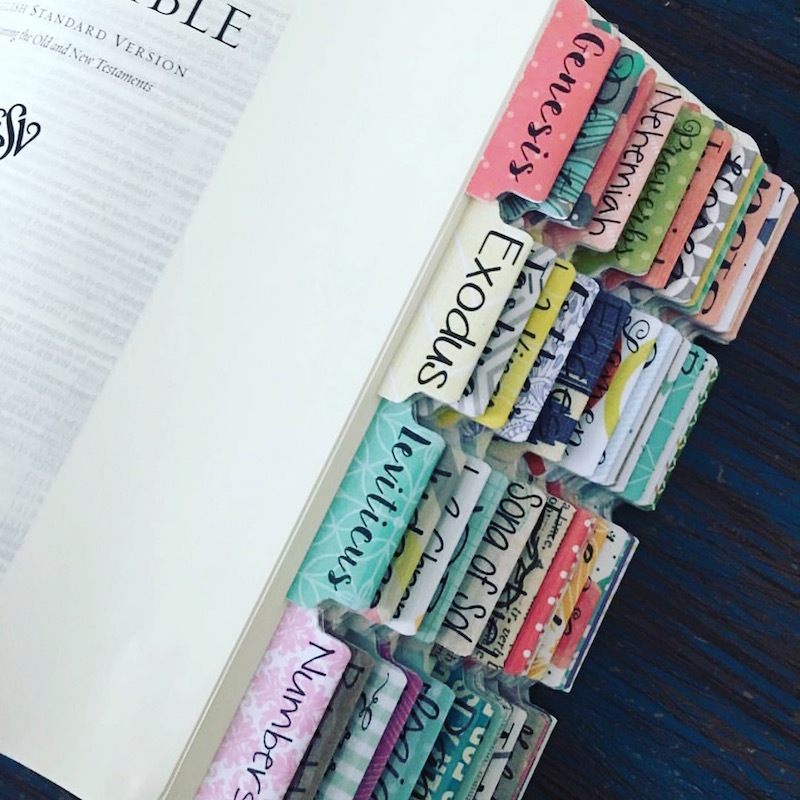 These colorful Bible tabs can help you dive deep into Scripture and learn the layout of the Bible. ReViving Hope is offering the code “BIS2018” for 20% off any order! Our friend, Katrina, spent hours researching the meaning behind various botanical plants and their religious significance. 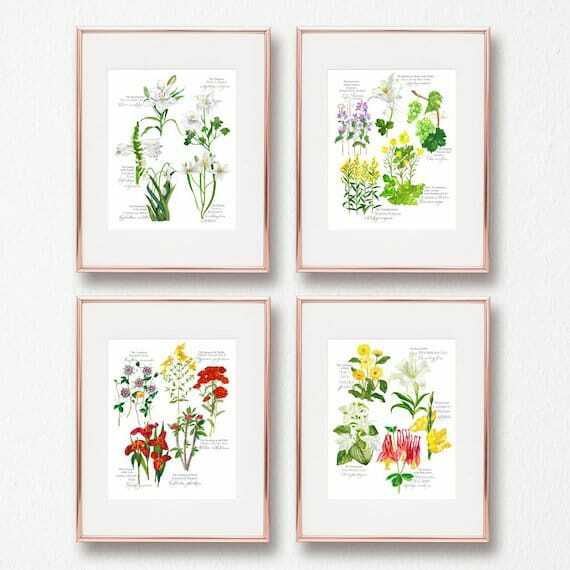 She created these display-worthy Rosary botanical prints to grace your home visually and spiritually. She also sells other beautiful Catholic watercolor art. 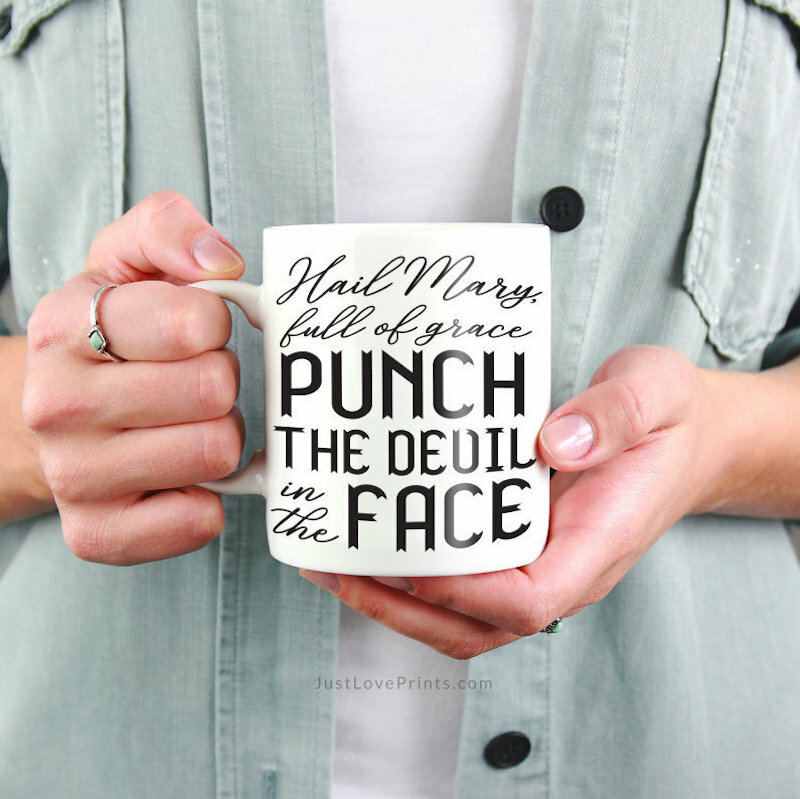 Our friend and devotional writer, Gina, makes Catholic prints for your home. 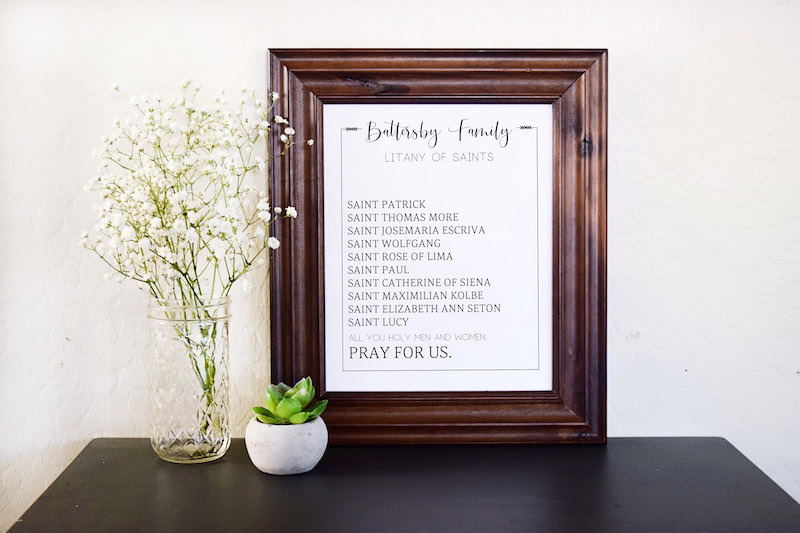 Someday Saints Designs brings you custom family litanies of Saints, personalized with your family’s favorite patrons. New this year, Gina also added zipper pouches, sewn with her Sacred Heart and Immaculate Heart fabric pattern. Use code “FREEFIFTY” for free shipping on orders over $50. Good through December 14, 2018. Place your order here. 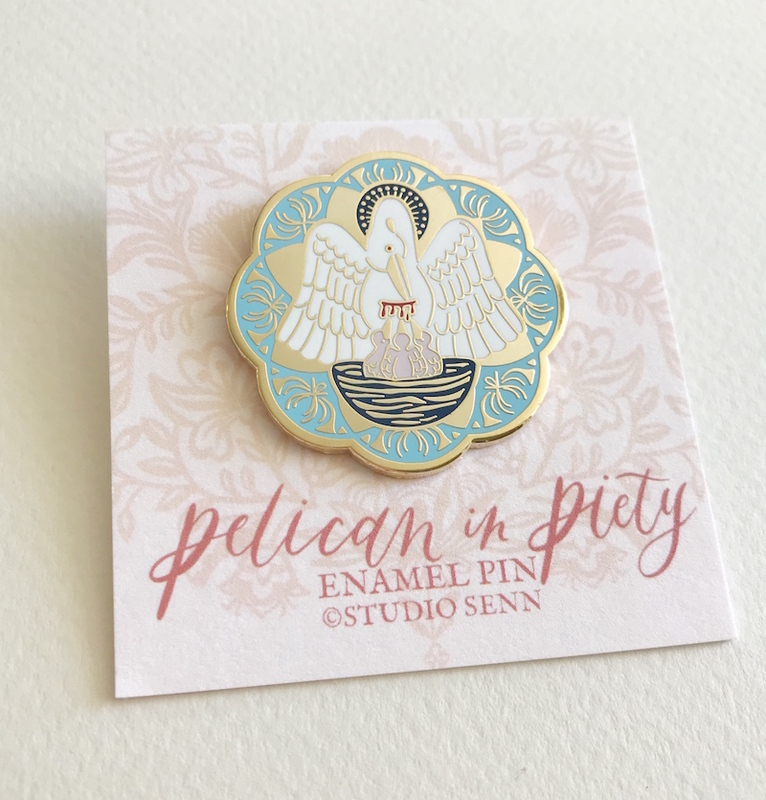 Studio Senn creates unique watercolor work and has recently started creating these gorgeous enamel pins. We also adore their saint ABC chart and new important-date calendar! Use the code “SUPPORTSMALL” to get 15% off the entire store (from Black Friday-November 30th)! The mission of Sweet Little Ones Shop is to help Catholic women decorate their homes in a meaningful, faith-filled way on a budget. 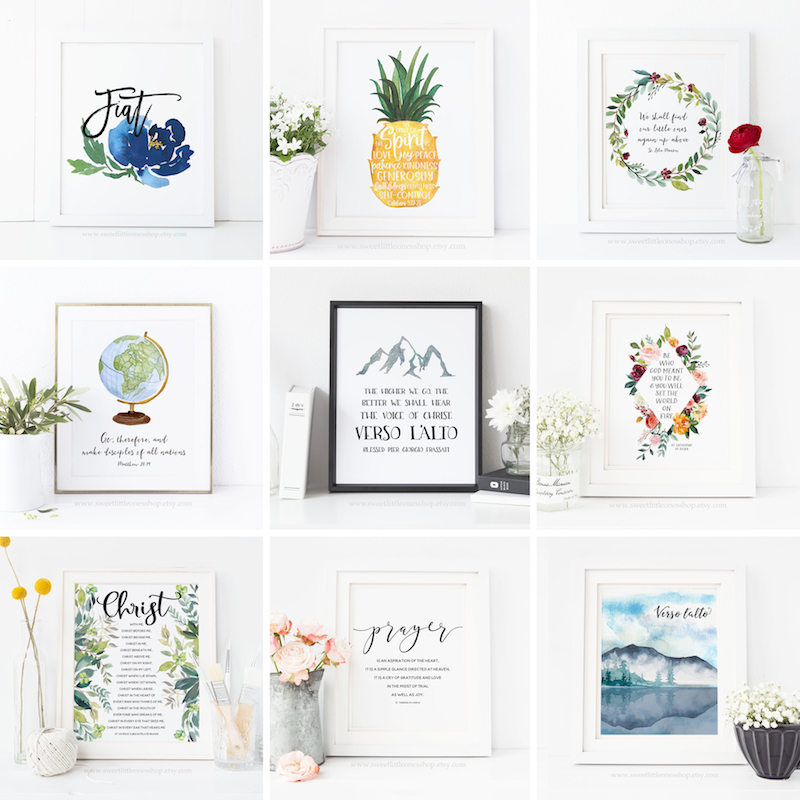 They offer prints, cards, and printable wall art that aim to serve as beautiful visual reminders that will inspire a deepening of the Catholic faith in our everyday lives. From Black Friday-Cyber Monday, get 30% off individual printable wall art and 15% off physical prints, sets of cards, & banners. Plus freebies and free shipping with every order! See all the freebies and details here! Kaitlyn designs the most delightful literary-themed products. 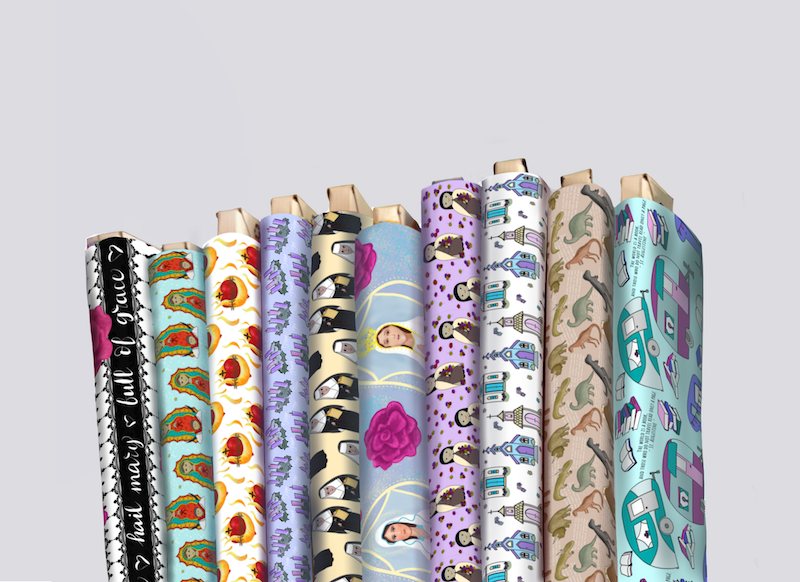 Bibliophiles will love her apparel, mugs, prints, and journals. There’s even bookish apparel for the little ones in your life! She also just released a new book this year. 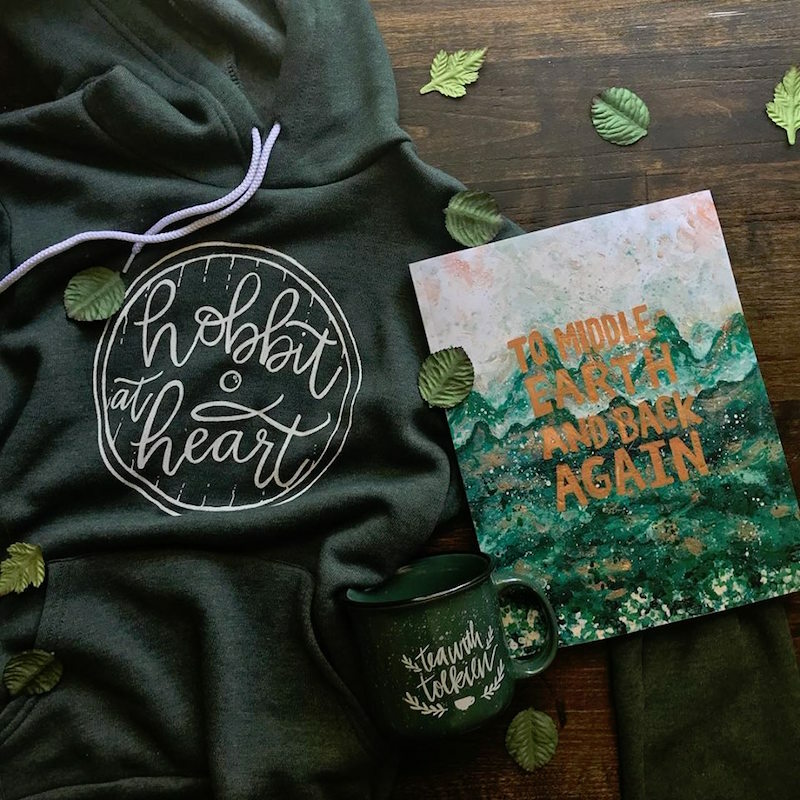 “To Middle-Earth and Back Again” is a Lord of the Rings companion journal and devotional, written to guide you through Tolkien’s epic tale and help you grow in ‘hobbitness and holiness”. This workbook journal explores Tolkien’s Catholic faith and the influence it had on his writings, inspiring you to reflection and action as we seek to carry the spirit of Middle-Earth into our own daily lives through journaling prompts, discussion topics, and tangible action items. Tea with Tolkien is running a sale from November 24th-November 26th. No code is necessary to receive the discount. However, if you mention in your order notes that you came from Blessed is She, they’ll send you a free gift with with each purchase over $20! We can get enough of these knit coffee mug and beer bottle cozies! 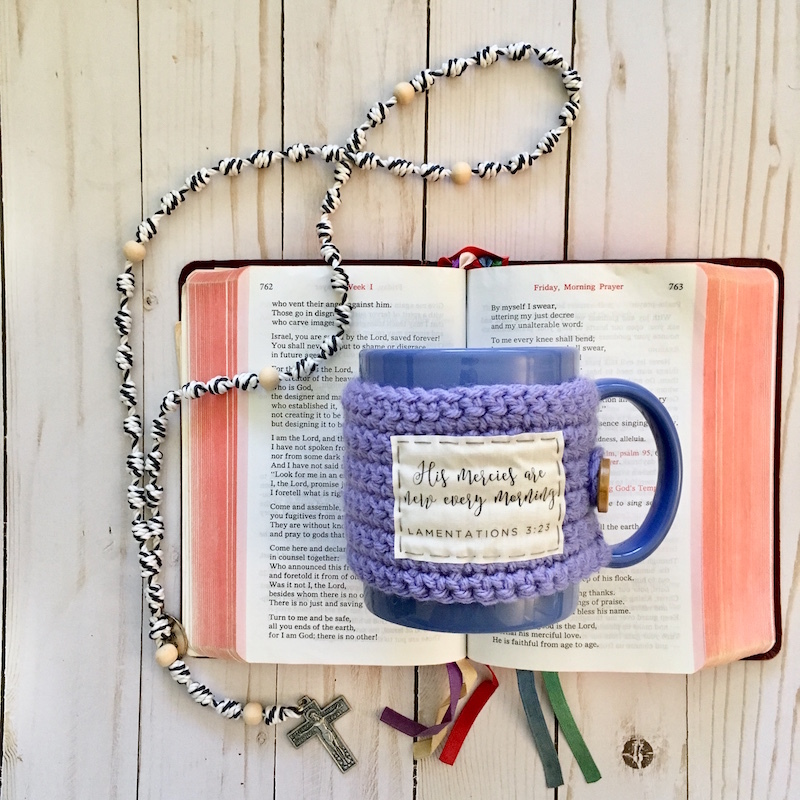 Complete with Catholic Saint quotes and clever sayings, these cozies are colorful companions for your favorite beverage. Buy a new mug cozy and get free shipping! Trésor Bleu believes jewelry is not about what you have, it’s about who you are. 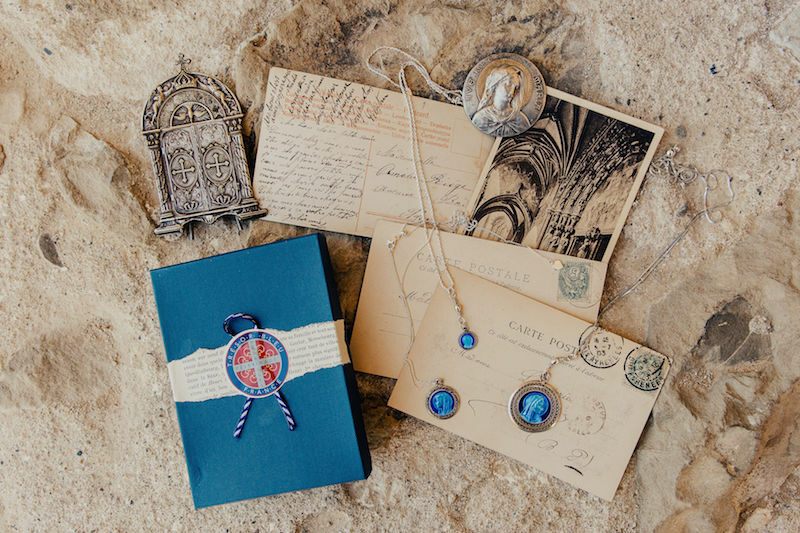 Trésor Bleu vintage Catholic medals are from Lourdes, Sacré Cœur, and other Catholic Pilgrimage Locations in France and around the world, dating 1860-1960, but have new chains and hardware. Enter code “BIS” at checkout for 20% sitewide through Christmas! 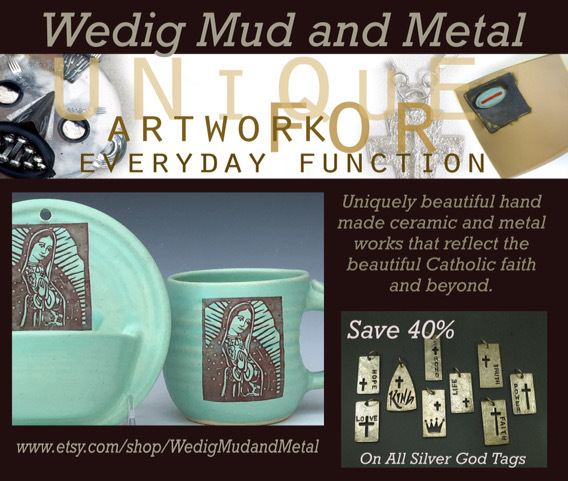 Wedig Mud and Metal is offering a special code for Blessed is She that runs from November 23rd-December 7th. Use code “BLSD40” for 40% off all silver God Tags. Lauren creates stunning watercolor prints for your home and office. We’re loving this lyric print from “O Holy Night”—perfect for Christmas decor around your house! When Beauty Met Truth will be offering 30% off storewide on Black Friday only. No coupon code needed. They are also offering 15% off storewide with coupon code “BIS15” when used at checkout from November 24th-December 18th. Allison, who created the very first Blessed is She rosary, is a beautiful sister who creates rosaries and other handmade goods. 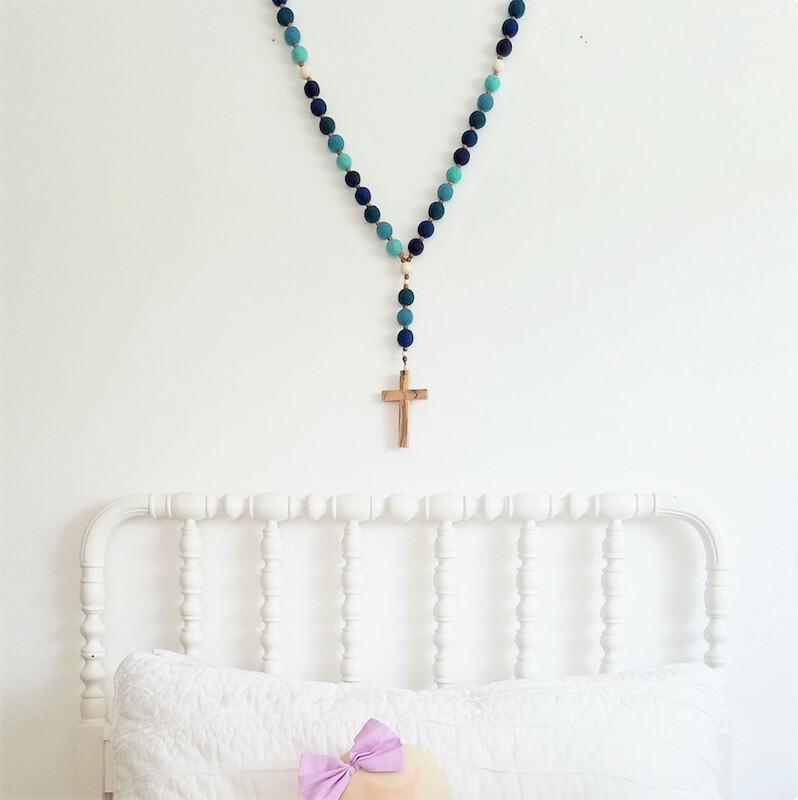 We especially love her wall rosaries which would be an incredible addition to any room! 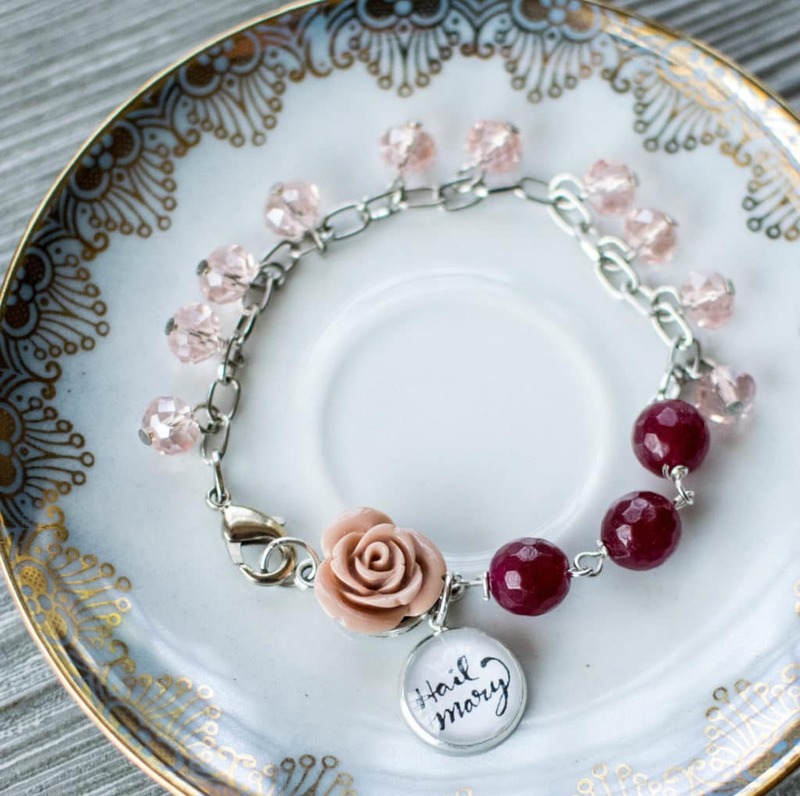 Wild Hope Co. creates encouraging products for today’s Catholic woman. They focus on beauty, goodness and truth by sharing sacred strength for the restless heart. Save 20% on your entire order when spending more than $5.00 with code “SAVE20” from November 23rd-November 26th. 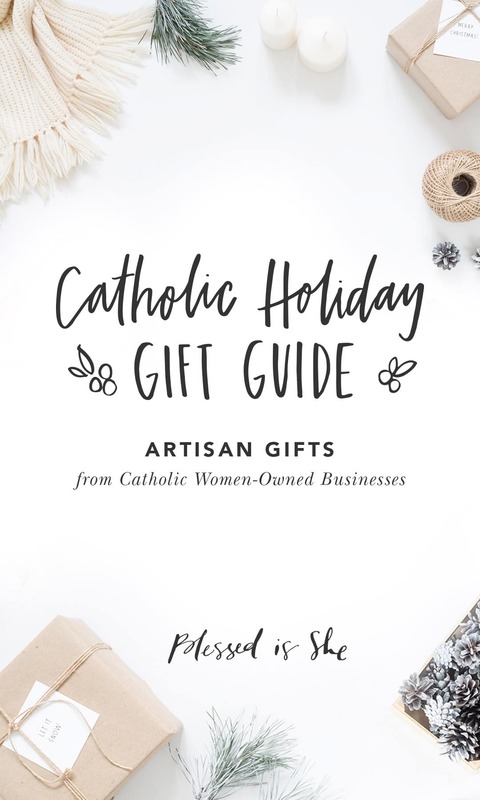 We couldn’t leave you without letting you know that our very own Blessed is She shop offers liturgical journals, planners, the first and only Catholic Journaling Bible, our Blessed Conversations studies, jewelry, apparel, large prints, and more. We’re offering you the above deals on everything in the shop throughout the week of Thanksgiving and beyond. We’re really thankful for your support over the years! 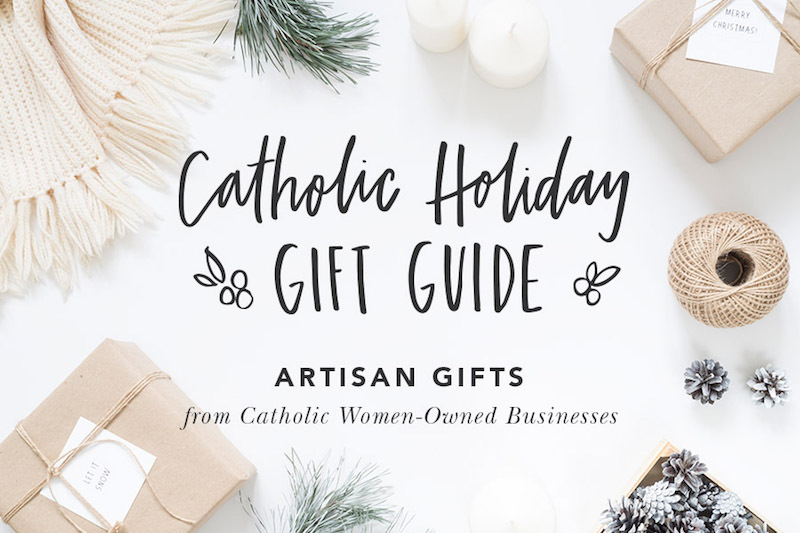 We hope this Catholic Christmas gift guide is useful to you as you begin your shopping. 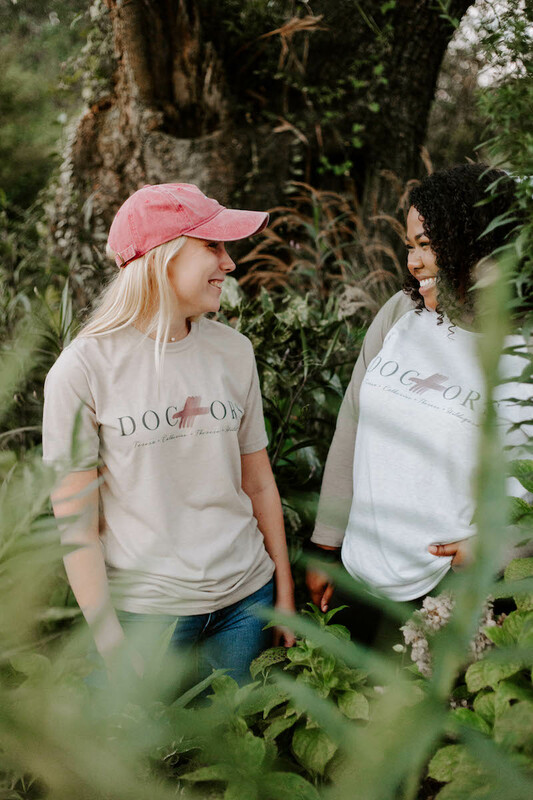 Thank you so much for being willing to spend your hard-earned dollars on business that are ethically run by women who are striving to love Jesus, serve others, and provide for themselves and their families. Where will you be shopping this year?! Awesome list! Thank you! I’ll definitely be supporting these women with some of my gifts this year! If you have room next year I’d love to be added to the list! Wonderful list! This has been so useful, already! Thank you! Wow! I love your gift ideas. I found you through the Shop Hop link Shining Light Dolls posted. Are you running promos with all the shops involved in that? Is there a code for Rose Harrington? There’s a description here but they left the code off. Hi Emily! There wasn’t a coupon code offered this year, but it looks like her gorgeous full Rosary botanical print is on sale today! If custom taxes didn’t exist I’d buy everything from these sites!!! These women are doing marvelous stuff. Hey – can we have the code for Rose Harrington’s shop? It seems yo be missing! Thanks do much! Hey Emily! There wasn’t a coupon code offered this year, but it looks like her gorgeous full Rosary botanical print is on sale today!